Aloha friends! Hope you’ve all been enjoying this little spate of sunshine. Today’s post is a little nod to my roots – yarp, it’s an Asian Cosmetics special! So, in case you didn’t know – I normally do an asian cosmetics haul everytime I come back from a family holiday in China or Malaysia but today it’s a Japanese feature! I love trying out cosmetics from all over the world but worldwide shipping can be a biaaatch – don’t even get me started on customs duty! Luckily for me, one of my cousins lives in Japan and some Japanese treats were brought back for me! Best holiday present ever. First up is this Limited Edition Steam Cream. I’ve heard so many things about the legendary Steam Cream – it’s a cult beauty product but I’ve never got round to buying a tin! Steam Cream is an all-purpose natural moisturiser and possibly one of THE lightest textured moisturisers I’ve ever used. Infused with steam, it delivers a burst of easily-absorbed moisture to the skin and it smells heeeavenly. PSST. There’s something technical about the steam by the way – it basically holds ingredients together with the lightest touch so that it melts into skin upon contact. The Steam Cream feels really luxurious and while it’s almost a touch TOO moisturising for everyday use on my oily skin, I love applying it to my neck, my decollete and my hands – especially before bed. It has a lovely lavender scent which is ideal for pre-snooze relaxing. And you only need a little bit! The texture of the Steam Cream is super light but with powerful moisturizing ability. A dream for combination/dry skins! The thing about Steam Cream is that it comes in different designed tins and this one is a limited edition Japanese design. I also got sent this awesome green tea soap-in-a-bag thing. Let’s be honest, I have no idea how to read the instructions so I assumed that you put it in the bag and lather right? Okay – part retraction, outside of the bag it is basically.. a normal soap. Howver. Once you get it in the bag and WOW! As soon as you rub it together, it lathers up like some sort of foam bomb. It reminds me of those foaming shower gels which look perfectly innocent and clear until you add water and BOOM. 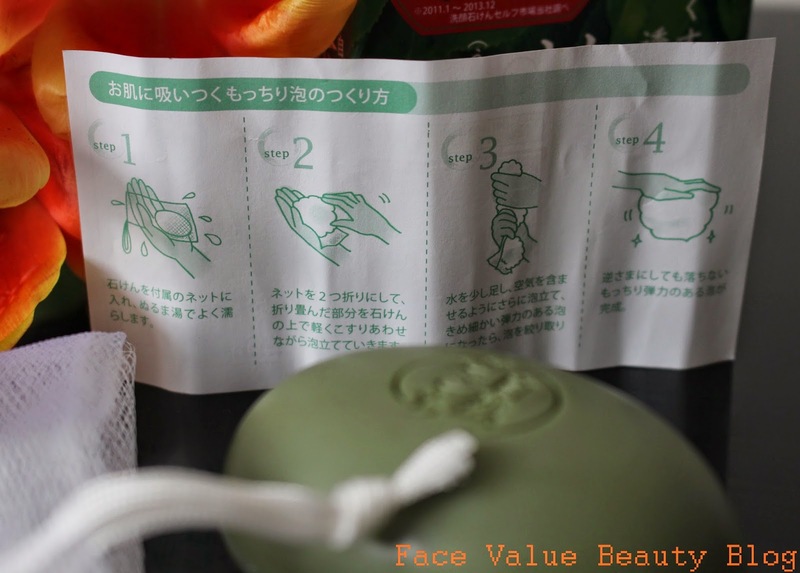 Second plus point – the bag is great for exfoliating too. It’s kind of like a mini loofah! The soap suds are really smooth, very natural and not at all artificial feeling. You don’t get that slippery, soap seal that you get with normal soap. I would also assume that the Green Tea has some crazy-good benefits for your skin but… I can’t read the label, so I don’t really know. All I can see is a big word for TEA and something being No.1… Conclusion: it must be AWESOME for you. If only I knew what this soap was called!!! Mystery Green Soap, how am I going to replace you!?! So there we go – a little family present from overseas… AND ITS ALL FOR MEEE! It’s times like this when I really enjoy having relatives in distant lands. It really makes up for not getting to see them as often! Have you seen anything like this super-foaming mystery soap before? And what about Steam Cream – have you tried it? If you have, what’s your tin like? !